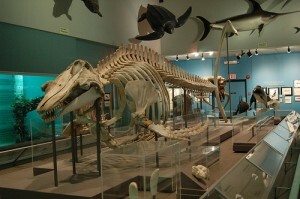 Nova Scotia does nature well so it’s not surprising that Halifax has a top-notch Natural History Museum. This is a great rainy-day activity for the kids, or really anyone who loves learning about animals. You can get in free on Wednesday evenings. A huge frog is the first thing to greet you, hanging from the building’s outside corner. Inside, you can stand underneath life-size models of whales and turtles or marvel at a real pilot whale skeleton from Sable Island. Don’t forget the dinosaur fossils, the working bee hive and, in the summer, an exotic butterfly house. The geology exhibit has glowing rocks and a meteorite. Eat at the museum cafe or bring a lunch to eat in their picnic area. Drivers will appreciate the museum’s parking lot ($1.50/hour, bring coins). Finding a spot to park shouldn’t be much of a drama. Directions: 1747 Summer Street. Behind Citadel Hill and beside the Public Gardens. From anywhere downtown, you shouldn’t be more than 15 minutes away by foot. Bus route 20 starts from the ferry terminal and passes the museum’s front door. Admission fees: Adults $3.75, kids $3.00, family $7.75-10.25. Opening hours: Seasonal. June 1 to October 15, Monday to Saturday, 9:30am to 5:30pm and Wednesday until 8pm. Sunday, 1pm to 5:30pm. October 16 to May 31. Tuesday to Saturday, 9:30am to 5:30pm. Wednesday until 8pm. Sunday, 12pm to 5pm.